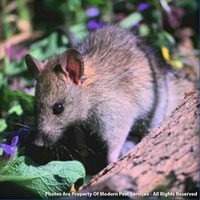 From the head to the rear end of the body, not including the tail, the roof rat is about 6 – 8 inches in length. The tail is an additional 7 to 10 inches. The color is gray to black, with the belly being white, gray, or black. It has large eyes and ears and a scaly tail. 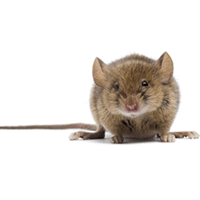 Roof rats are nocturnal, cautious, and shy about new objects or change in their environment. They have poor vision, but a keen sense of smell, taste, hearing, and touch. Roof rats are so named, because they prefer nesting in upper structures, such as attics. Outdoors, likely nesting spots are trees, clinging vines, fences, etc. ; although it is not unheard of for them to burrow underground or live on ground floors in structures. They can enter structures through an opening 1/2 or larger. 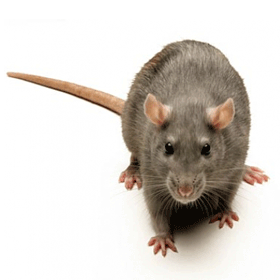 Rats are associated with the transmission of several diseases and occasional bites. They will eat almost anything if necessary but prefer such foods as fruits, vegetables, and cereals. Roof rats reach sexual maturity at about 2 to 5 month of age. The female averages 4 to 6 litters per year, with an average of 7 young per litter.